High school students learned first-hand about STEM (Science, Technology, Engineering, and Math) careers from the people who actually work in them. A dozen local professionals from MnDOT, 3M, Chandler Exhibits, DiaSorin, and Lift Bridge Brewery visited students in their Project Lead the Way (PLTW) class. They took part in a STEM version of speed dating. The professionals rotated from table-to-table for a quick five minute Q&A from students. It was a fun and quick way to get exposure to a number of STEM careers in their own classroom. They even had their own SnapChat filter for the event. For more pictures visit our Facebook page. Teachers (preK-grade 12) are putting a new focus on students' social and emotional needs, with the goal of improving academics. 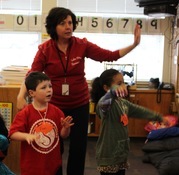 More than 300 elementary teachers have been trained in Responsive Classroom (RC), a program designed to help strengthen social, emotional and academic growth by creating safe and welcoming school communities. Additional training is taking place for middle school and high school staff in Developmental Design (DD) and Building Assets, Reducing Risks (B.A.R.R.) programs, which expand the key concepts of RC into a middle school and high school environment. Read more. Stillwater Junior High ninth grader Hannah Farmer won the top award at the 80th annual Minnesota State Science and Engineering Fair in Minneapolis. She was one of four students selected from over 160 high school participants be named a finalist to the Intel International Science and Engineering Fair (ISEF) in Los Angeles. Read more. A robot is making school a (virtual) reality for a homebound Oak-Land Junior High​ student. Using a VGo robot, sixth grader Molly Gilbert is able to replicate herself from her own home and have the freedom to move around the classroom as if she were physically there. Read more. A special visitor from Kenya, Africa dropped by Rutherford Elementary to personally collect letters to deliver to pen pals half a world away. The second graders have been corresponding with students from Kenya. Read more. There's still time to catch a show! 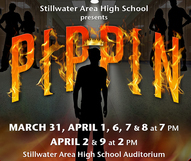 Join us for Stillwater Area High School's latest production, Pippin, running now through April 9. The ensemble cast tells the story of a young prince who longs to find passion and adventure in his life. To prove his loyalty to his distracted father, King Charles, Pippin goes to war. But when the leading player convinces the prince to fight tyranny, Pippin kills Charles and takes over the throne. Learn more. Hey parents ... you should have received an email last week from Peachjar about our new e-flyer distribution system. We're really excited about this new way to bring you information about events, activities and programs offered to students by local non-profit organization – like Girl and Boy Scouts, enrichment camps, scholarships for music or sports programs and much more! Learn more. The school board will hold a retreat to work on their goal of cultural competency on Tuesday, April 11 from 8-11:30 a.m. The retreat will take place at Family Means, 1875 Northwestern Avenue South, Stillwater. The school board will host a legislative breakfast on Wednesday, April 12 from 7:30-8:30 a.m. at the Early Childhood Family Center, 1111 Holcombe Street South, Stillwater. The school board will have a closed session on Thursday, April 13 upon the conclusion of their business meeting at Stillwater City Hall, 216 North 4 th Street, Stillwater, for attorney-client privilege to discuss pending litigation.